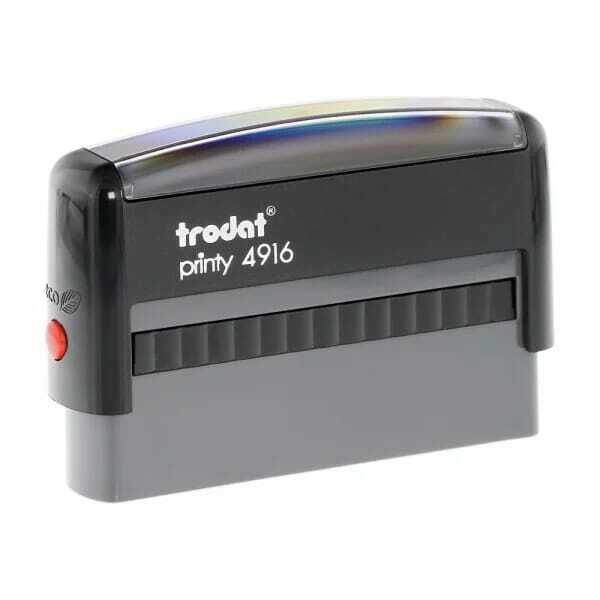 The Trodat Printy 4916 self-inking stamp has a maximum text plates size of 3/8" x 2-3/4"- (9mm x 68mm) allowing you to create 1 or 2 lines of customized text. The Trodat 4916 is the perfect 2-line stamp when you need your business name and account number to stamp on checks. Ideal as a Signature Stamp. Just scan and upload your signature and we will reproduce it on the stamp. Save time when authorizing invoices or purchase orders or signing checks. The Trodat Printy 4916 is a climate-neutral product produced with the maximum possible recycled plastic so you can feel good about helping the environment. Running low on ink? The replacement ink cartridge 6/4916 is available in black, blue, red, green or violet. Replacement pads are supplied in packs of three. Customer evaluation "Trodat Printy 4916 3/8" x 2-3/4" - up to 2 lines"
PERFECT AND A 3RD OF THE PRICE THAT I PAID FOR THE SAME STAMP AT STAPLES. Trodat self-inking stamps are easy to use and no messy ink pad to deal with!